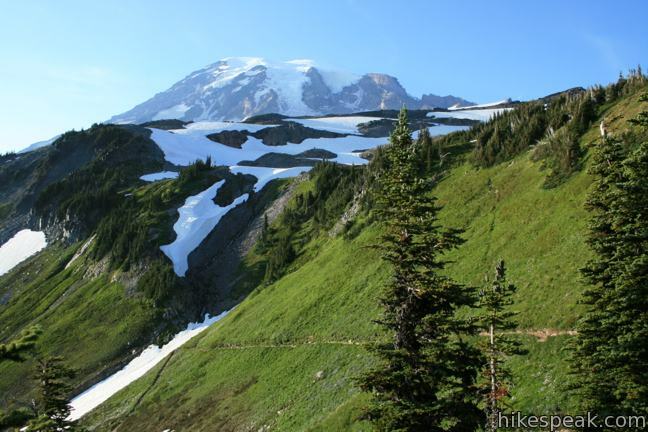 Is there a better hike in Mount Rainier National Park than Skyline Trail? 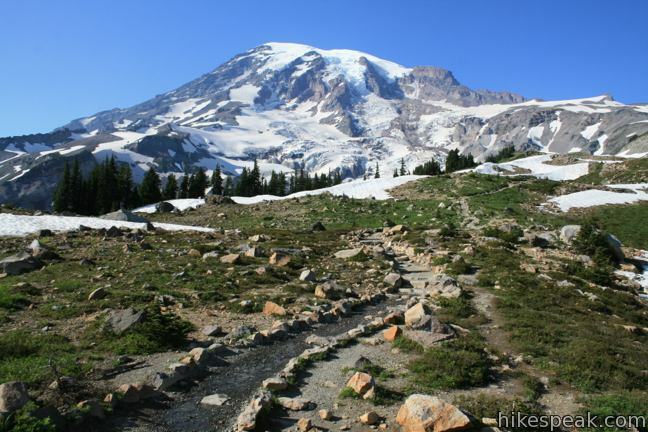 The hike begins from Paradise, a perfectly named destination on the southern slope of Mount Rainier. 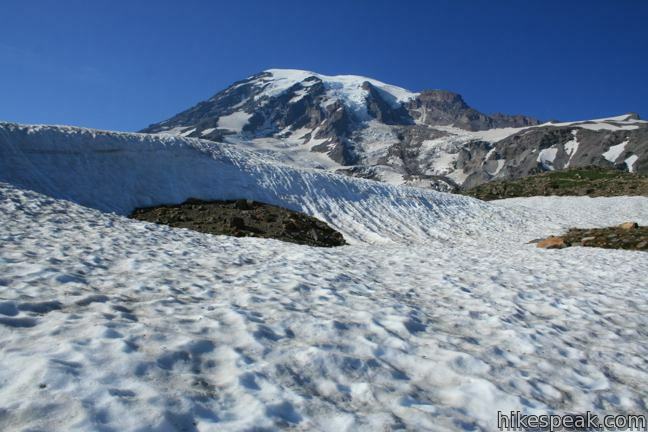 Loop up to Panorama Point, a stunning viewpoint that is about as close to the summit of Rainier as you can get without an ice ax. 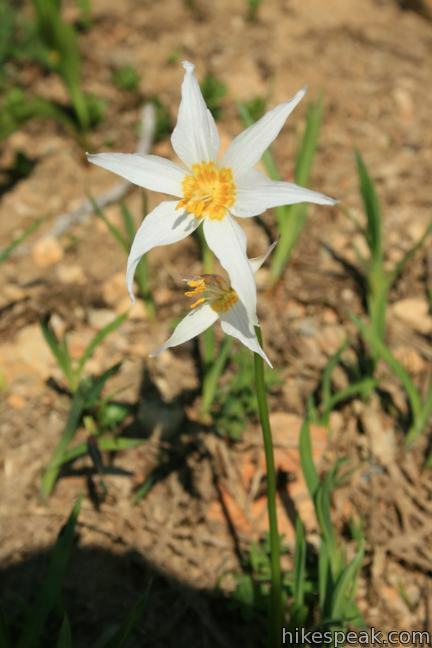 The trail passes snowfields, streams, waterfalls, and fields of alpine flowers. On a clear day, the views along this loop are nothing short of incredible. 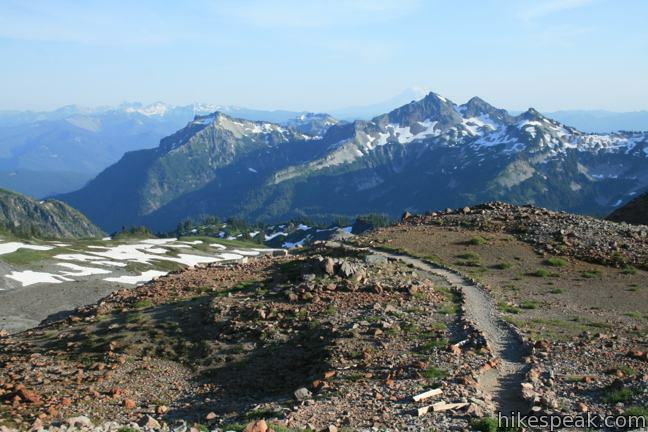 The entire trail is 5.5 miles long with 1,625 feet of elevation gain. That distance can be trimmed to 4.5 miles by using the Golden Gate Trail shortcut. 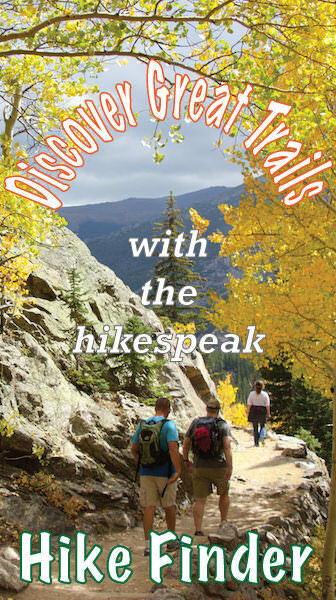 There are several trails exploring the Paradise area that connect to Skyline Trail allowing for a variety of extensions. Does it get any better than Paradise? 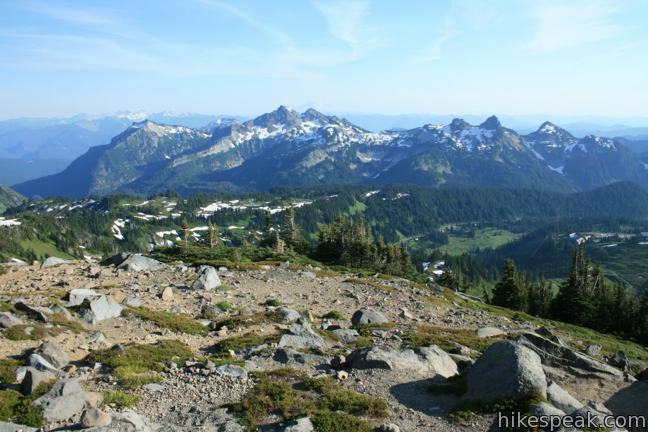 Hike up Skyline Trail to find the answer – yes! The trail is paved for the first half mile, but don’t be dissuaded; it doesn’t last. There are several junctions along the way, but Skyline Trail is always well marked. Head straight through two junctions about 1/4 of a mile from the start. 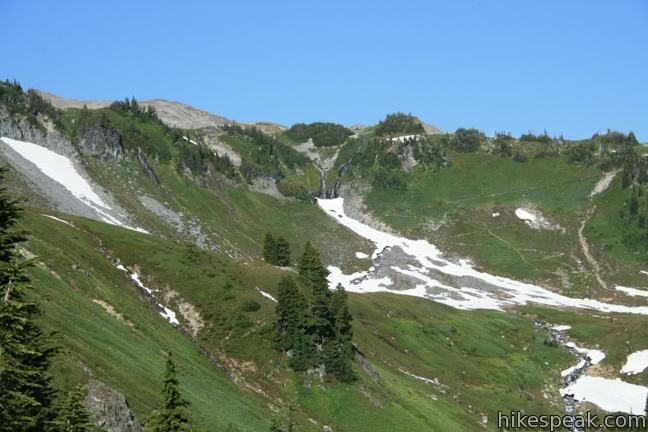 The steep trail then gains 200 feet over the next 1/4 mile to a junction with Dearhead Creek Trail. 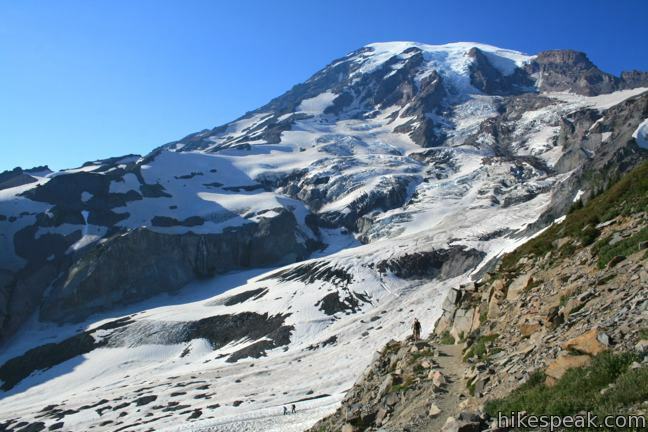 The enticing views of Mount Rainier and Nisqually Glacier on the early portions of this hike are just a taste of things to come. Stay to the right through the junction with Dearhead Creek Trail, then make a left at the next junction with Alta Vista Trail, 0.6 miles from the start. 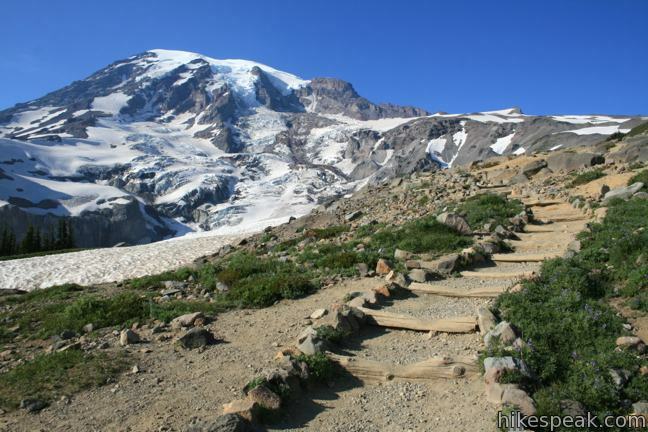 Leave the pavement behind as you hike straight toward Mount Rainier. 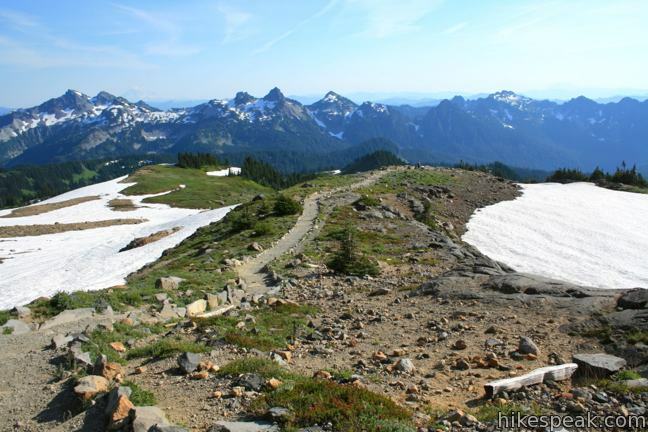 Cherish the next 1.25 miles, which climb 850 feet to Panorama Point. 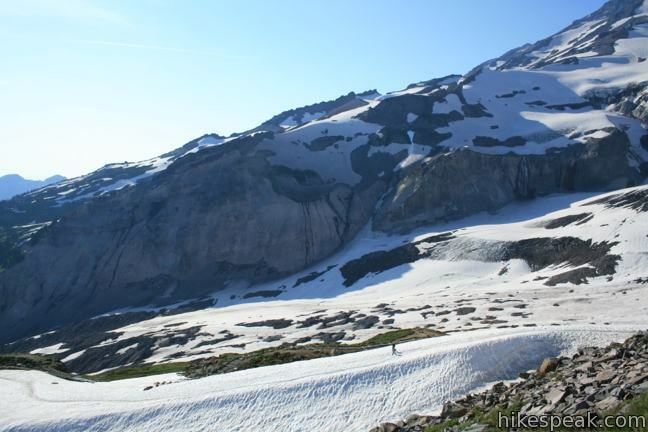 The trail ascends a rocky ridge overlooking Nisqually Glacier. Stop and listen to the crackling sound of the moving ice. 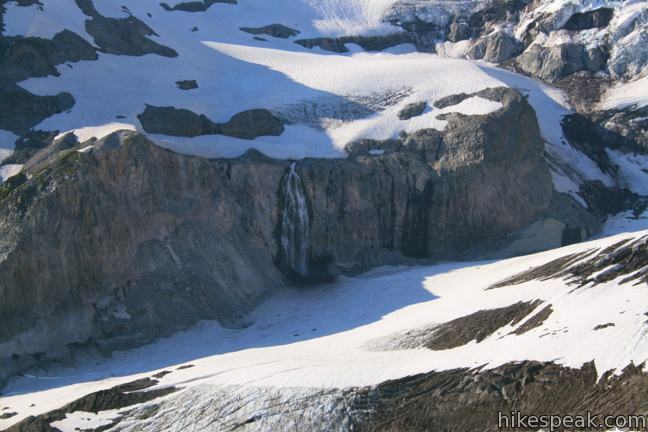 On a warm day, you may spot a waterfall flowing out of the glacier, down a cliff, and back into the glacier – all on the slopes of Mount Rainier. 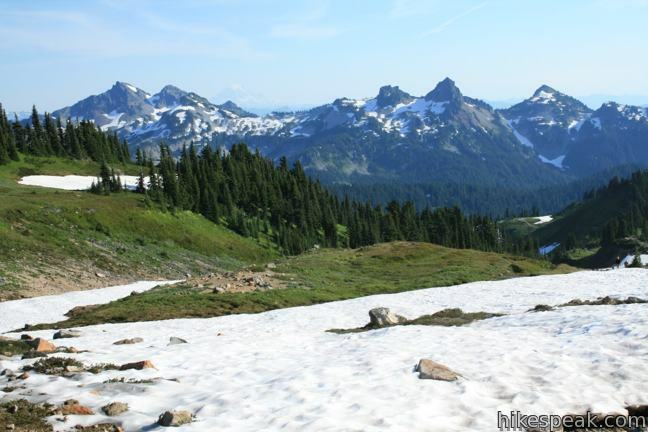 The staggering views continue as you turn up a switchback and climb to Panorama Point. 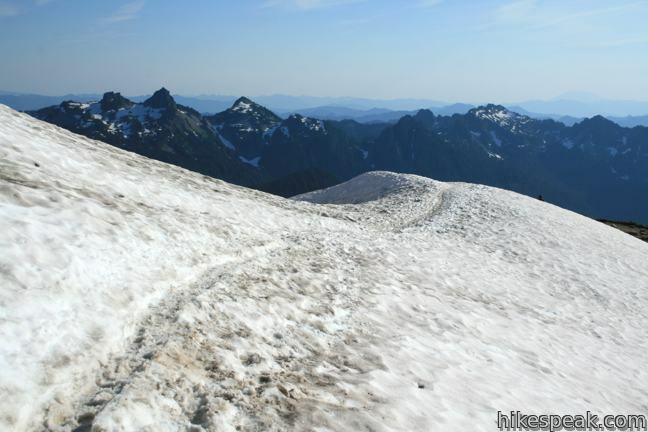 The trail may cross several snowfields, which cover this wild landscape for much of the year. 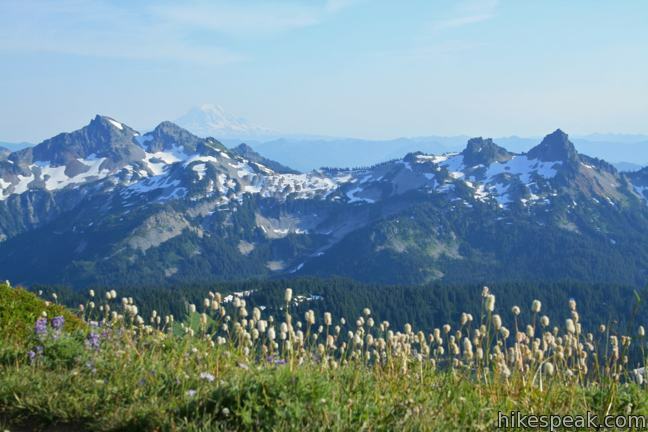 Panorama Point doesn’t just have a big view, it has an enormous view, looking south over Paradise toward the Tatoosh Range. 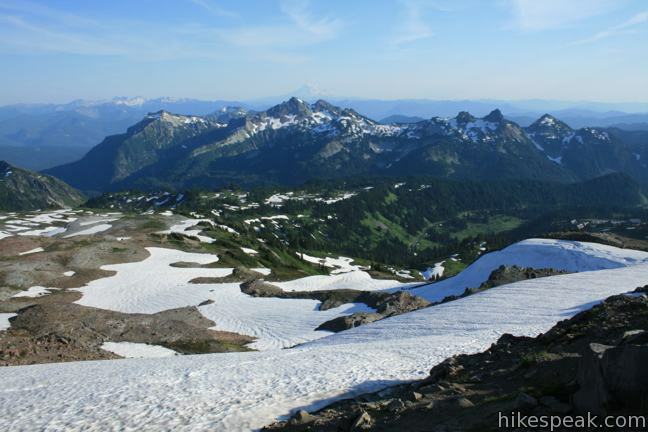 Beyond these sawtooth mountains are two of the other great volcanoes in the Cascade Mountains, Mount Adams and Mount Saint Helens. 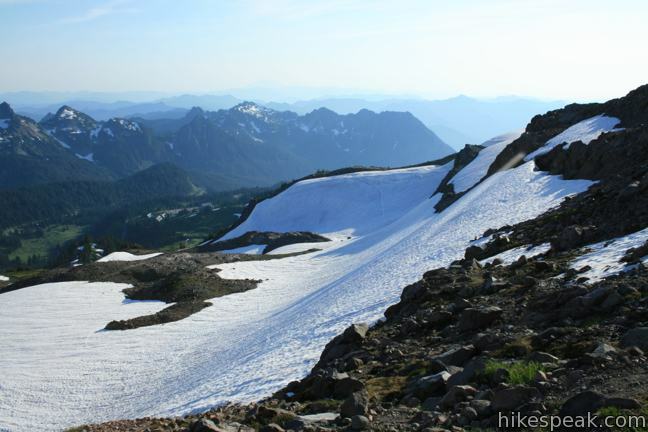 From Panorama Point, Lower Skyline Trail drops off a steep snow shelf on a potentially dangerous path that cuts close to half a mile off the hike. 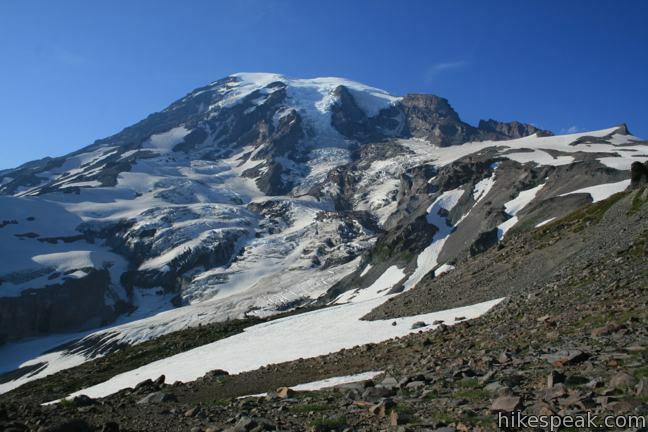 If the snow level is high and you aren’t wearing crampons, continue on Upper Skyline Trail, which gains an additional 300 feet, climbing farther up the rocky slope toward Mount Rainier. 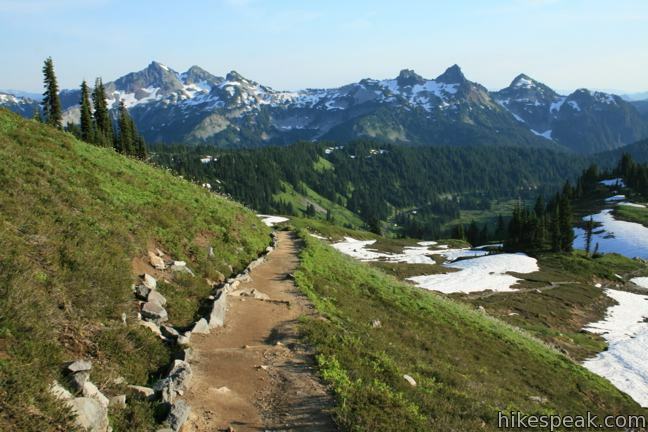 Eventually, the trail turns downhill, and after just over 3/4 of a mile, reunites with the lower route. 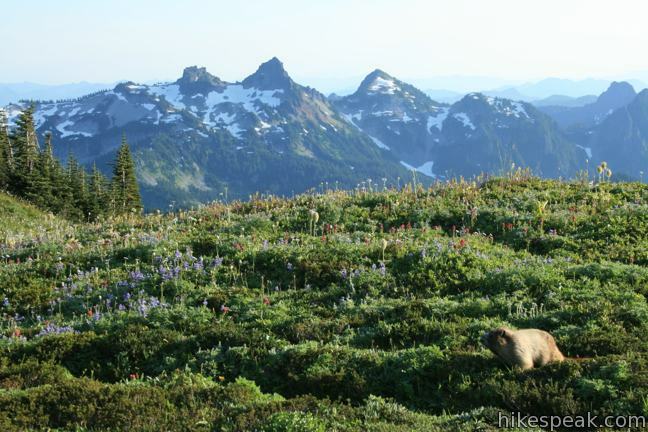 Hike another half mile through a pristine mountain landscape covered with streams and wildflowers to a junction with Golden Gate Trail. Straight ahead, Skyline Trail descends another two miles to Myrtle Falls, passing Sluiskin Falls along the way. 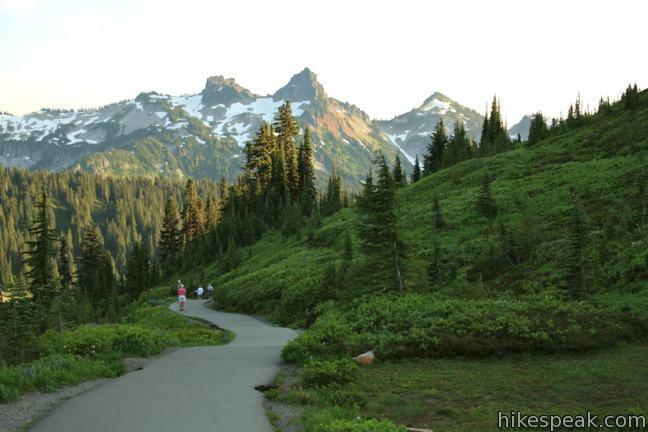 To the right, Golden Gate Trail is more direct, descending just a mile to a reunion with Skyline Trail at Myrtle Falls. There is no bad trail through Paradise. Just decide how much time you have and make your way down to the falls. Skyline Trail crosses a footbridge above Myrtle Falls to reach a spur trail that descends to a closer look at the waterfall. 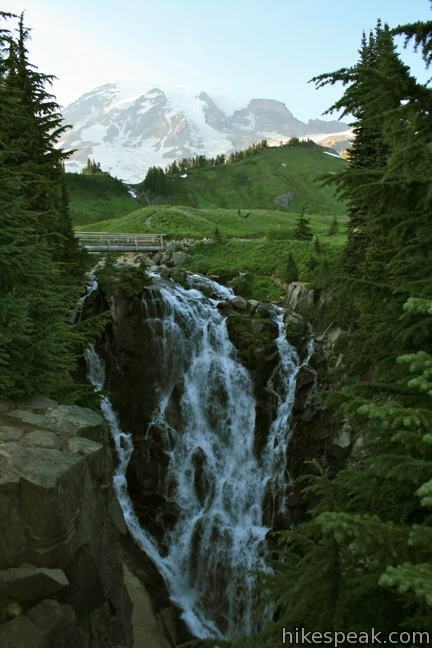 Myrtle Falls is a postcard waiting to happen, a beautiful silken waterfall flowing from the snowfields on Mount Rainier – simply stunning. 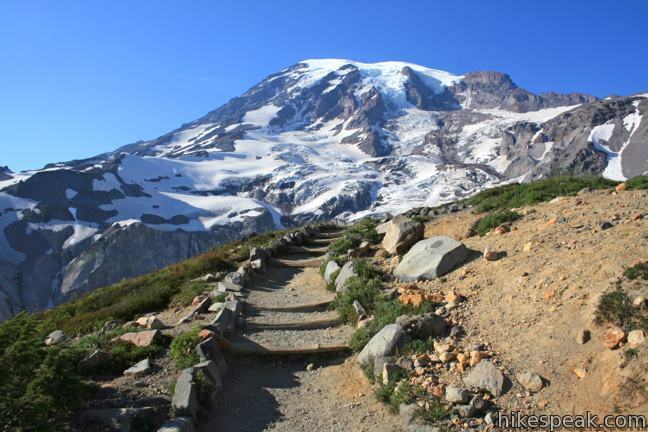 The pavement resume at Myrtle Falls, which means the great hike is coming to an end. 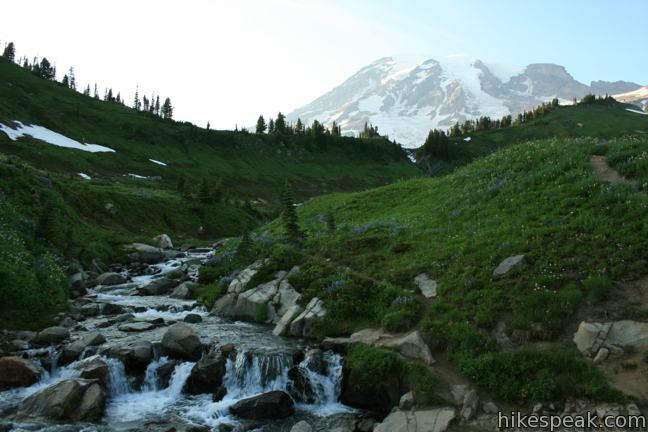 It is less than half a mile back to the trailhead next to the Paradise Inn. 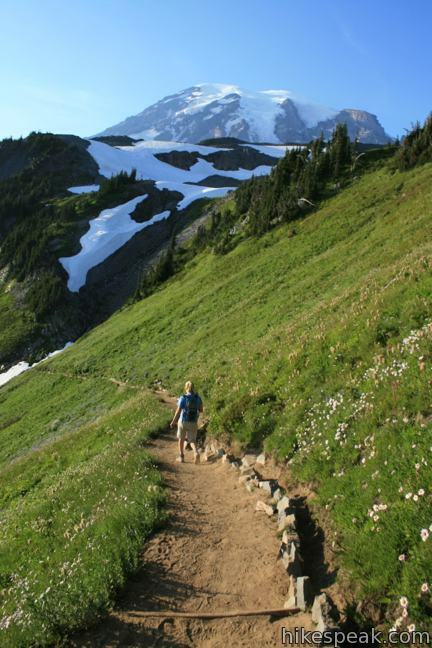 Skyline Trail could easily be called Mount Rainier’s must-do hike. It is an incredible journey through a rugged and beautiful world. 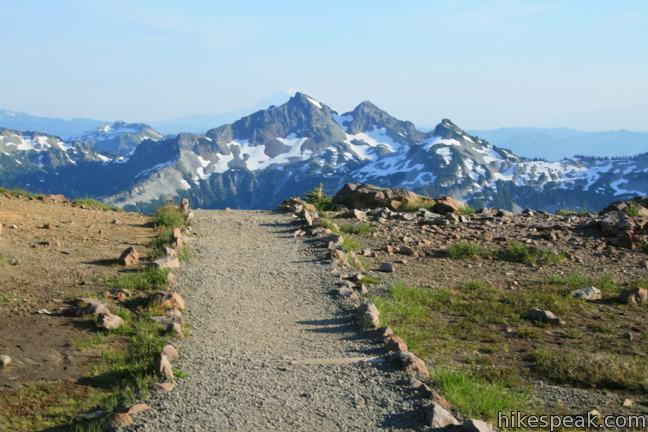 There is a national park entrance fee to reach Paradise, but no permit is required to hike Skyline Trail. 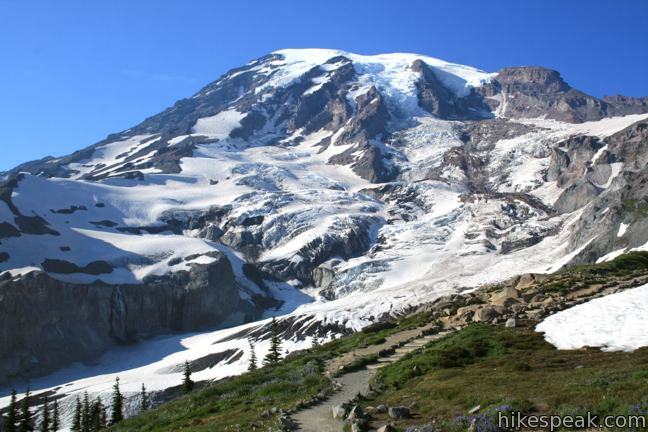 To get to the trailhead: From the west, from the 5 Freeway in Tacoma, take exit 127 onto Route 512 east and drive 2 miles to Route 7 South. 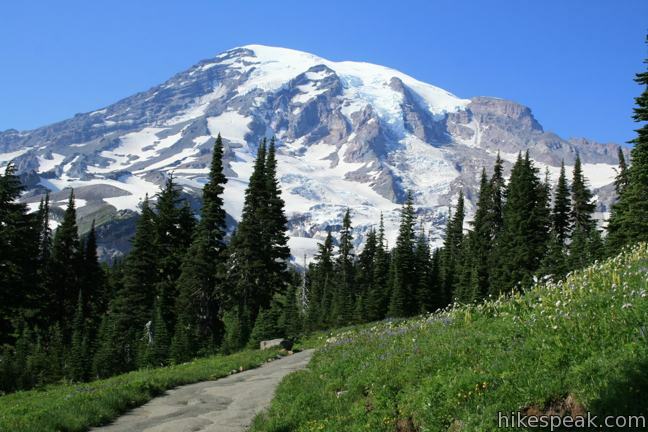 Turn right and drive 65 miles, passing through the town of Ashford and into Mount Rainier National Park. 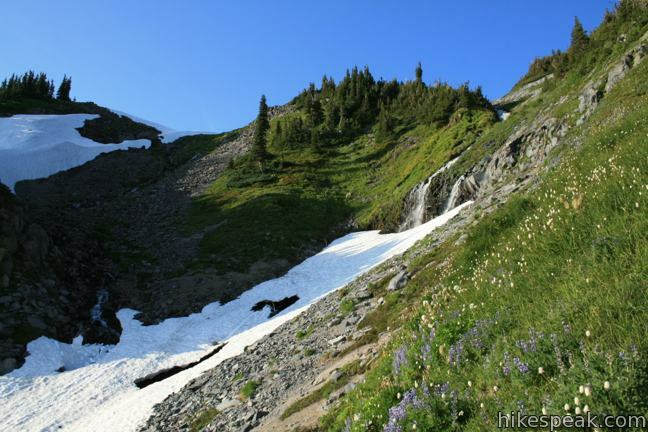 Pass Narada Falls and turn left on Paradise Road, concluding the trip with two miles of switchbacks up the Paradise. From the east side of the park, take Route 123 to Stevens Canyon Road (near Ohanapecosh) and drive west for 19 miles to Paradise Road. Turn right and drive two miles of switchbacks up to the parking area at Paradise. 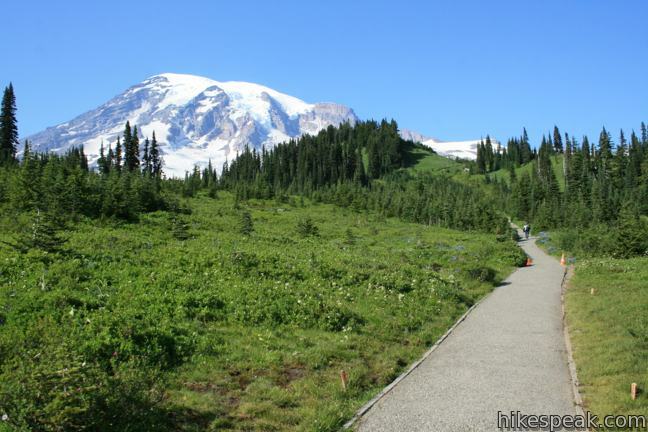 The trail is located between the visitor center and the inn. 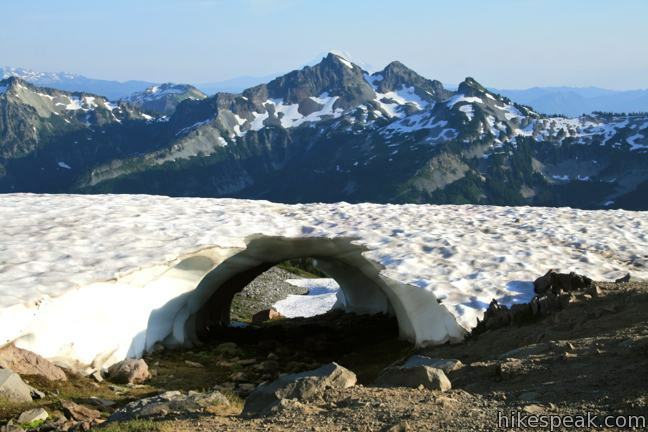 This picturesque 6-mile trail visits a fire lookout tower near the summit of Mount Fremont, with incredible views over Mount Rainier and the surrounding mountains. 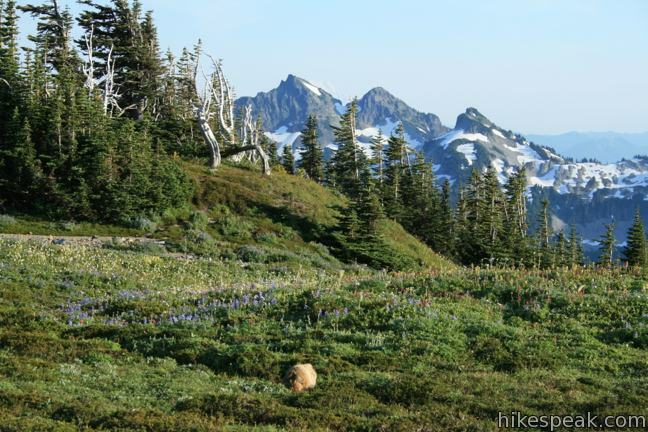 This colorful 3.75-mile loop crosses fields of summer wildflowers, passing subalpine lakes and great views of Mount Rainier. 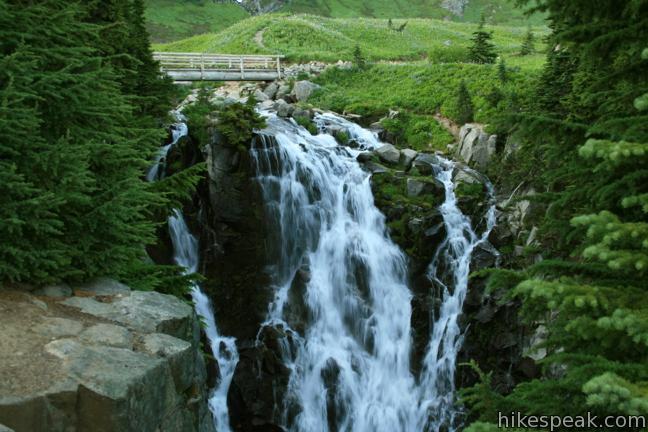 This 3-mile loop travels through an old-growth forest to a waterfall on Ohanapecosh River in the southeast corner of Mount Rainier National Park. 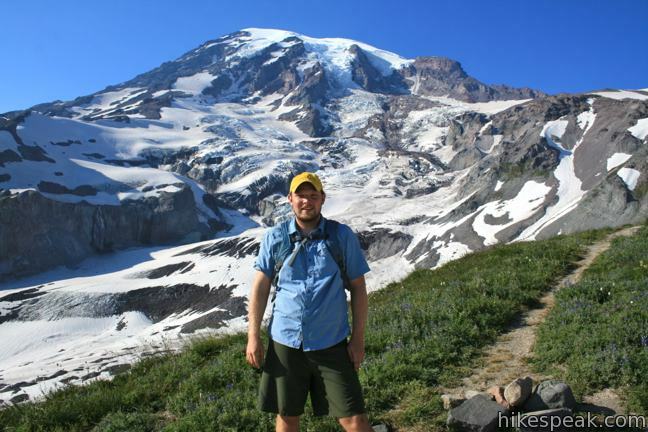 Explore other hikes in the Evergreen State, including Mount Saint Helens National Volcanic Monument. 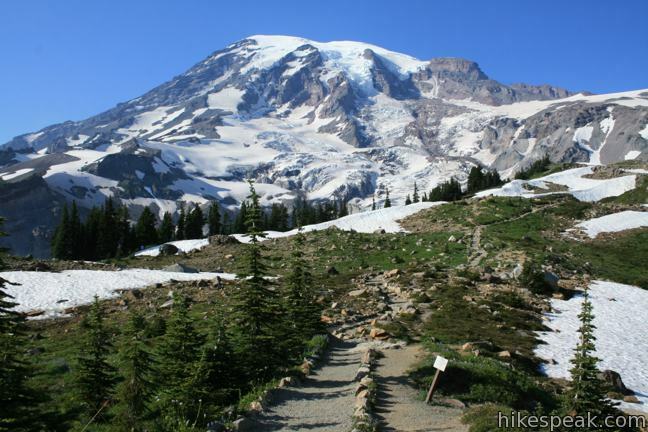 Information on the developed campgrounds in Mount Rainier National Park as well as places to camp in the surrounding national forest. 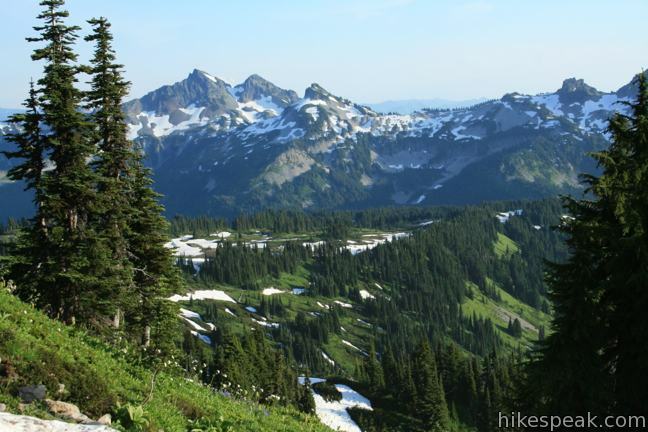 My sister is coming in town next week and wants to hike Skyline Trail. 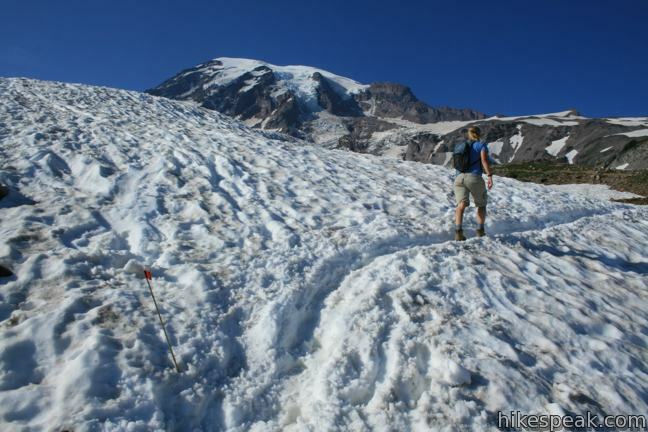 How do I find out the conditions/weather of this trail before we make the journey from Issaquah? 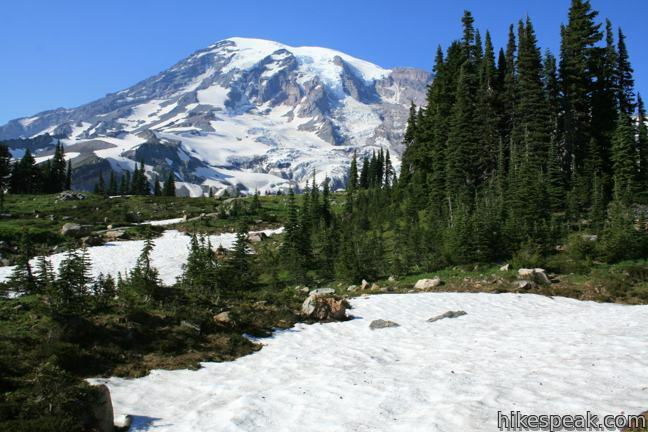 The Mount Rainier National Park Twitter Account is a good place to get information about road closures. For more information, call the park at 360-569-2211 or 360-569-6575. 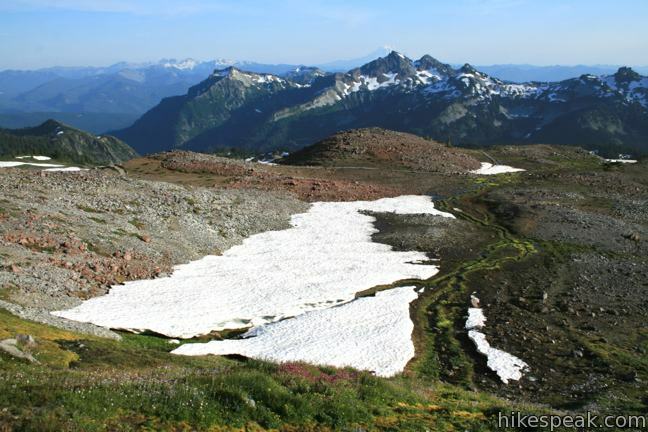 Can someone tell me the current conditions of the Skyline Trail? I will be there on May 25. 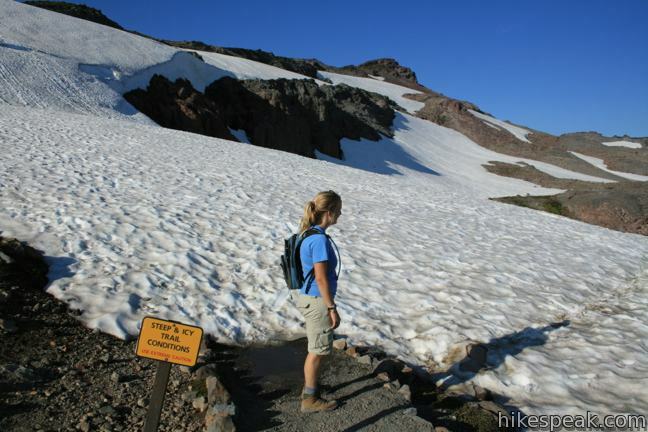 Will this trail be too hard for an 82 yr old who is in good health?